A powerful and moving tribute to all the animals that served, suffered and died alongside the British, Commonwealth and Allied forces in the wars and conflicts of the 20th century, stands on the edge of Hyde Park in London. 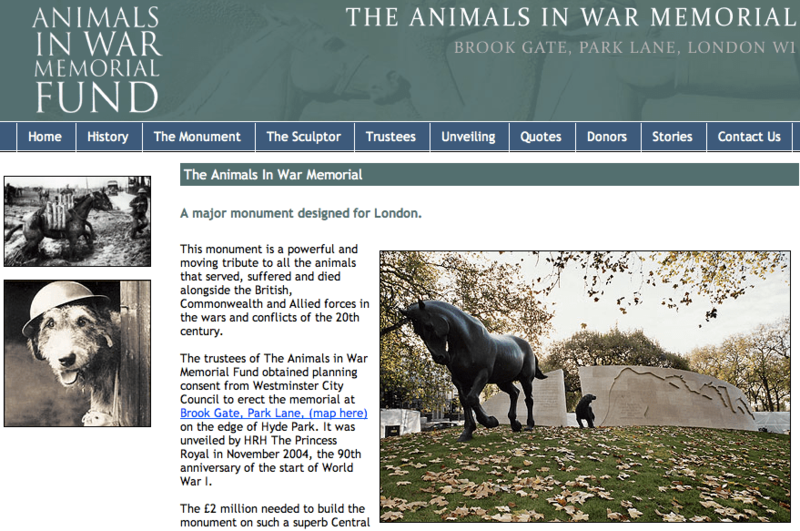 The trustees of The Animals in War Memorial Fund erected the memorial at Brook Gate, Park Lane, London in 2004. It was unveiled by HRH The Princess Royal in November of the same year on the 90th anniversary of the start of World War I. The £2 million needed to build the monument on such a superb Central London site came from a national appeal and the generosity of many individual donors, charities and companies. Created by renowned sculptor David Backhouse FRBS, RWA, FRSA. The monument is constructed in Portland stone and cast bronze. Standing 17.68m wide and 16.76m deep, the memorial has a strong visual impact, both from distant and close views. The sculptor has designed the monument in order to involve visitors and to attract people to enter it and become personally informed about the subject. There are three principal elements in the design; two different levels and a dominating and powerful wall between them. On the lower level, two heavily laden bronze mules struggle through an arena, enclosed by the dominant wall symbolising the war experience. The mules approach a flight of steps that leads through the wall. Beyond the wall, on the upper level, a bronze horse and dog stand facing north into the gardens, bearing witness to the loss of their comrades and representing hope for the future. Images of the many different animals used in 20th century conflicts are depicted in bas-relief on the inside of the longer section of wall. On the outside of this wall a line of ghostly silhouettes is carved, representing the animals lost in the conflicts. There are inscriptions on both sides of the shorter section of wall, including the name of the monument and information about theatres of war and the numbers of animals lost. The names of major donors are carved on the outside of the longer section of wall. Many millions of animals served and often died alongside the British, Commonwealth and Allied forces during both world wars and they continue to play an important role to this day. These animals were chosen for a variety of natural instincts and tenacity. Eight million horses and countless mules and donkeys died in the First World War where they were used to transport ammunition and supplies to the front and many died, not only from the horrors of shellfire but also in terrible weather and appalling conditions. Mules were found to have tremendous stamina in extreme climates and over the most difficult terrain, serving courageously in the freezing mud on the Western Front and later at Monte Cassino in World War II. Equally they toiled unflinchingly in the oppressive heat of Burma, Eritrea and Tunisia. There are many inspiring and often tragic stories of the great devotion and loyalty shown between horses, mules and donkeys and their masters during some of the bloodiest conflicts of the 20th century, as can be read in Jilly Cooper’s moving book Animals in War, published by Corgi. The dog’s innate qualities of intelligence and devotion have been valued and used by the forces in conflicts throughout the century. Among their many duties, these faithful animals ran messages, laid telegraph wires, detected mines and IED’s, dug out bomb victims and acted as guard or patrol dogs. Many battled on despite horrific wounds and in terrifying circumstances to the limit of their endurance, showing indomitable courage and supreme loyalty to their handlers. More than 100,000 pigeons served Britain in the First World War and 200,000 in World War II. They performed heroically and saved thousands of lives by carrying vital messages, sometimes over long distances, when other methods of communication were impossible. Flying at the rate of a mile a minute from the front line, from behind enemy lines or from ships or aeroplanes, these gallant birds would struggle on through all weathers, even when severely wounded and exhausted, in order to carry their vital messages home. This Memorial is a fitting and lasting tribute to them all.